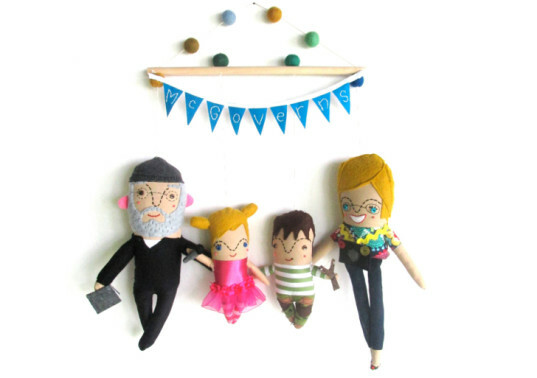 Pink Cheeks Studios is a Louisiana-based Etsy shop specializing in handmade felt mobiles and handcrafted toys. 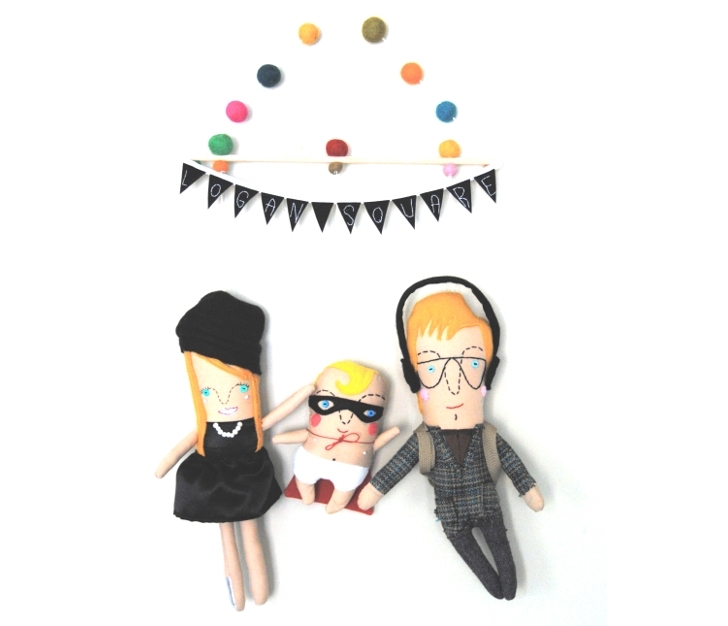 Shop owner Nichol Brinkman also offers a custom service, which allows you to commission an adorable "portrait" wall hanging of your family, lovingly crafted in felt and adding in any personal interests and pets as you wish. As Nichol says, "Your family is awesome. How about you have a memento done of yourselves!?!" To order a custom mobile, you simply start by deciding how many people you want included in the design: a family of three is $150, and a family of four is $185, for example. From there you can also purchase additional people or pets for $25 each using an “add-on” listing. Once you have settled how many figures will be on your mobile, the really fun part begins: customizing each character! Nichol describes each figure as “roughly two apples tall.” In order to fully customize all the hand-sewn details, she asks purchasers to send her details via Etsy convo. She needs a photograph of each person (or pet) if possible, as well as details of their hair and eye color, favorite clothes, any interests, or any specific way you wish for them to be represented. Wearing a unicorn costume is given as an example, to give you an idea of how accommodating she is willing to be on quirky details! Each wall hanging also comes with bunting that is hand embroidered with your family’s name. Alternatively, you could nominate a word such as love, family, or happy. You can also select the color of the felt balls that decorate the hanging thread. Understandably, these hand-crafted labors of love take time to complete, and the current waiting list is fierce — at time of writing it is 11 weeks, but we are heading into holiday season. Nichol advises customers check her shop for regular updates on turn around times for custom orders. So, while you won’t be able to get one of these wonderful pieces in time for this Christmas, they’ll make a wonderful birthday, Mother’s Day or “just because” present for the organized amongst us. Pink Cheeks Studios also has ready-made listings of toys and themed baby mobiles if you have fallen in love with Nichol’s style and would like something for a very special gift in the meantime. To order a custom mobile, you simply start by deciding how many people you want included in the design: a family of three is $150, and a family of four is $185, for example. From there you can also purchase additional people or pets for $25 each using an “add-on” listing. Once you have settled how many figures will be on your mobile, the really fun part begins: customizing each character! Nichol describes each figure as “roughly two apples tall.” In order to fully customize all the hand-sewn details, she asks purchasers to send her details via Etsy convo. She needs a photograph of each person (or pet) if possible, as well as details of their hair and eye color, favorite clothes, any interests, or any specific way you wish for them to be represented. Wearing a unicorn costume is given as an example, to give you an idea of how accommodating she is willing to be on quirky details! Each wall hanging also comes with bunting that is hand embroidered with your family’s name. Alternatively, you could nominate a word such as love, family, or happy. You can also select the color of the felt balls that decorate the hanging thread. Understandably, these hand-crafted labors of love take time to complete, and the current waiting list is fierce — at time of writing it is 11 weeks, but we are heading into holiday season. Nichol advises customers check her shop for regular updates on turn around times for custom orders. The portrait wall hangings make a wonderful birthday, Mother’s Day or “just because” present for the organized amongst us. Pink Cheeks Studios also has ready-made listings of toys and themed baby mobiles if you have fallen in love with Nichol’s style and would like something for a very special gift straight away.